To mark the fiftieth anniversary of the appearance our first publication (on 21 July 1966) we have set up a new website listing all the publications presently available from the company (together with a section on Terry Pratchett, whose agent we have been for 30 years). Until 21 July 2017, we are therefore offering all members of the leading Irish academic associations a special discount – 60% post free – on the hardcover (but not limited) editions of all titles in the following series (as long as we have stock). Please order direct from Colin Smythe Limited, not through booksellers, as at these terms we can’t afford further discounts on top of those we’re giving. We accept sterling and euro transfers, Mastercard, Visa, Paypal, and with reluctance, American Express. I’m afraid the website is not yet ready to accept payments directly: I’ve had a lot to write for the site, as you’ll see. 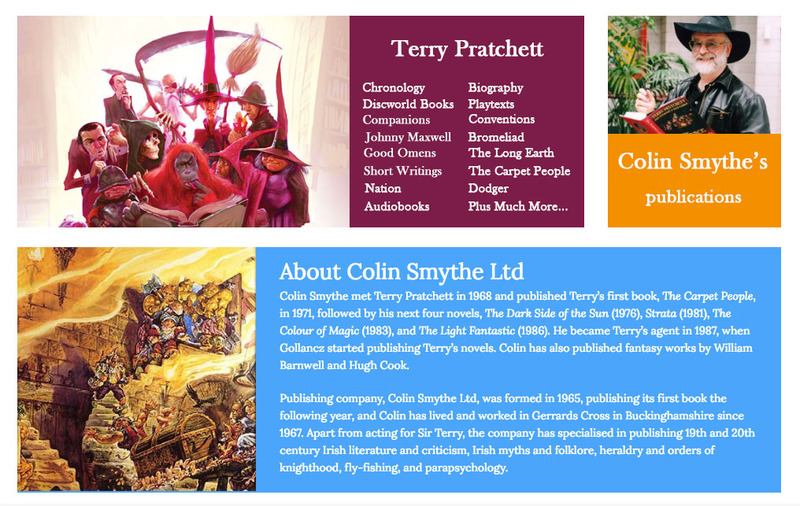 Click on Colin Smythe’s Publications, then Book Series and on any of the above headings to see what titles are available (looking at my Terry Pratchett pages is not obligatory). When ordering, please mention which society/association you belong to.